We recently teamed up with Skift to publish our 10 Business Travel Trends For 2019 Report, which outlines the industry shifts and trends you need to know this year. Over the coming weeks we’ll be highlighting key themes from the report, and offering advice for how both business travelers and corporate travel policy makers can stay ahead of the curve. We kick things off with a look at how boundaries that once solidly distinguished personal and business travel are now blurring for many of today’s travelers — and how corporate travel managers are rushing to catch up. In our modern, mobile-centric world, we take pictures of our dogs with the same phones we use to call into remote meetings from our kitchen tables, and our personal Instagram feeds sit side-by-side with professional Slack channels. We’re increasingly moving towards the center of a work/life Venn diagram, so it makes sense that this intersection would affect how we travel for work as well. One way this trend presents itself is through the combining of business and leisure travel — or “bleisure” travel as it’s sometimes (terribly, in our opinion) referred to — within a single trip, and there’s no denying this trend should be considered as we move into 2019. It’s first important to note that today’s workforce wants to travel — a 2018 Hilton Hotels & Resorts survey found that for U.S. business travelers between the ages of 23-35, 39% flat out would not join a company that did not offer travel as part of the job. And our 2018 TripActions Report found that 90% of respondents see traveling as a job perk. 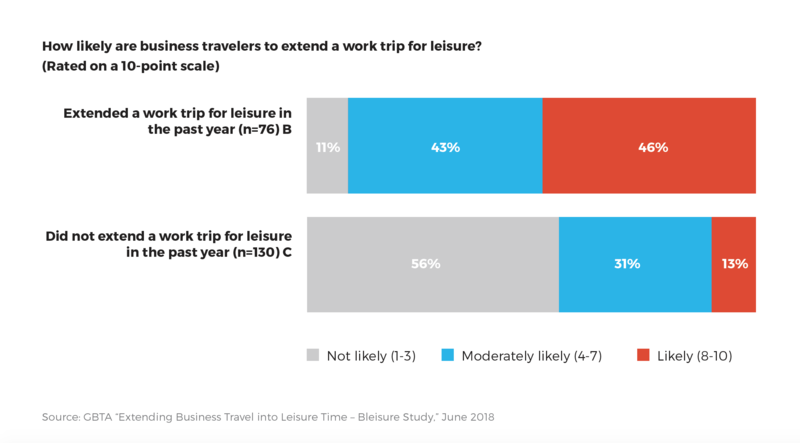 The desire to integrate leisure and business travel shows up in a June 2018 report from the GBTA Foundation and Hilton, which found that a staggering 89% of business travelers were at least moderately likely to extend a work trip for leisure during the past year. And according to our own survey results, the top reason for wanting to travel for work is the opportunity to check out a new city. 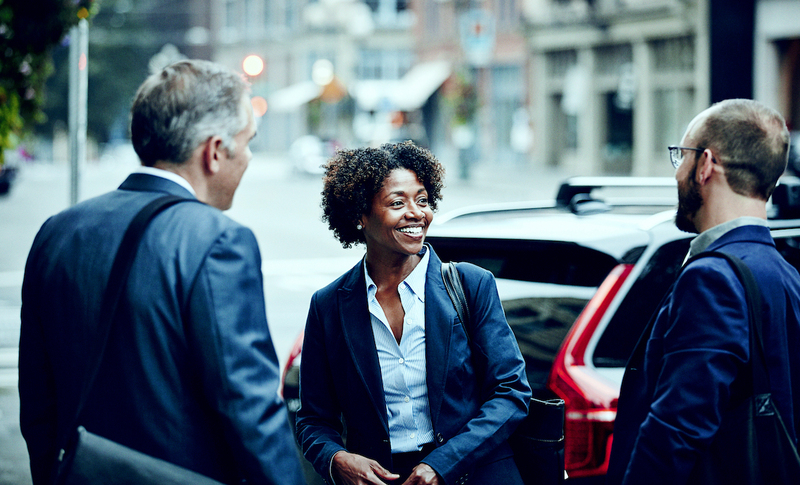 Zooming in even more on the blurring lines between consumer and employee experiences, we see a pressing need for business travel managers to better incorporate the sharing economy into their programs. While many (if not most) of today’s travelers turn to services like Airbnb and Lyft when traveling in their personal lives, historically, corporate travel policies haven’t been so quick to integrate these services. Policies often lacked the expense account functions set up to easily approve transactions, and it was rare for sharing economy inventory to surface in employee travel booking searches. While it’s true that executive-level corporate travel decision makers and sharing economy companies are continuing to professionalize their services, further integrating them into existing corporate travel platforms, the principal driver of this shift is the changing habits of business travelers themselves. A 2018 Skift study of the ridesharing habits of U.S. business travelers, completed in partnership with Lyft, found that 79% of respondents put ridesharing as their first choice for ground transportion — ahead of taxis, rental cars, and car services. That preference is why more than 90% of Skift respondents said their organization now permits ridesharing services for business trips. In 2019, this organic groundswell of sharing economy app adoption among business travelers is likely to be matched by growing efforts to further formalize and integrate such services into corporate travel policies and tools. With automatic expensing services for business users from Lyft and Uber, that path to integration into corporate policy is already established. While perhaps slower to advance within the corporate travel industry, home-sharing is also gaining traction as a result of growing consumer trends, especially among Millennial and Gen Z employees. More than one-third of respondents in this demographic surveyed for our TripActions 2018 State of Business Travel Report said they book Airbnb-type accommodations — along with boutique hotels — as a way of “fulfilling their desire for unique travel experiences.” And for its part, Airbnb is responding by expanding and formalizing its own corporate travel service offering with the launch of Airbnb for Work. Looking ahead in 2019, it appears business travelers will likely continue these trends of mixing business with leisure travel and using sharing economy services during business trips, whether they have formal company approval or not. The challenge then is for travel brands and corporate travel managers to keep up with that employee demand as companies not allowing for “bleisure” flexibility or sharing economy service options within their travel policies will only end up frustrating employees, and hindering their own business growth and bottom line as those employees go “rogue”. There’s no doubt that the rise of “bleisure” travel and ride and home-sharing services comes with some unanswered questions. How does a company approach additional costs? How does it enable its travel solution to make necessary distinctions? What’s the best way to manage duty of care? But while policy makers and travel managers are grappling with these challenges, the fact that they are evaluating these needs and asking these questions in the first place is a step in the right direction. For an even closer look at how these and other big trends are affecting the corporate travel space, be sure to read our complete 10 Business Travel Trends For 2019 report.